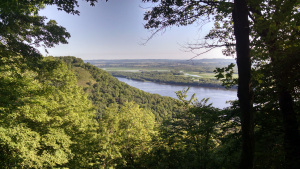 A morning of hiking through forests to expansive views of the Mississippi and the bluffs and prairies that surround it has me breathing more deeply. As the sun gets higher, the perfect Minnesota summer breeze is like a gentle hand on my forehead. I want to stop. I realize we’ve been moving moving moving all week – driving, riding, hiking, cooking, cleaning up, setting up, breaking down, moving — so I choose on this flawless afternoon to sit at the edge of the campsite. Just sit. After a patient ten seconds, I decide that nothing is going to happen. I will spend the afternoon looking at these eight trees and these three flowers and that log and nothing will happen. What a silly waste of this beautiful day to sit here and miss out on it.